It looks like there is a wording mistake in a rule of the Forum Guidelines. (...) Spam, flooding, advertisements, chain letters, pyramid schemes, and solicitations are also forbidden on this forum. NB : The definition given ("sending multiple meaningless posts") is that of flooding, not spam (which is an unsolicited commercial message, generally advertising). These two terms are distinguished in the legal notice. (uncountable, computing, Internet) Any undesired electronic content automatically generated for commercial purposes. 4. (Internet, transitive, intransitive) To paste numerous lines of text to (a chat system) in order to disrupt the conversation. There is a fine difference between "Spam" and "Floods". The word " Flooding " means the deliberate, unsolicited "flooding" of a medium with content. Floods are meant to disturb the normal operation of a medium. For example massive publishing of senseless texts in a public forum. Also, a person, who disturbs a public meeting by permanent interruptions, does a form of flooding. Flooding may be illegal in some cases. For example if it causes economic damage. In most cases "Spam" is produced to publish advertisements. While "Floods" are at most a form of vandalism. Conclusion : IMHO, the rule should be "Don't flood" - rather that "Don't spam". You missed the point, genius: the point was that of DEFINING THE TERM for the forum's specific purposes. "The word " Flooding " means the deliberate, unsolicited "flooding" of a medium with content. Floods are meant to disturb the normal operation of a medium." ... are saying exactly the same thing. Don't you have something worthwhile to do? Indeed, I've missed this point. I've only described the usual/common meaning of both terms (that I've seen on dozens of other web forums), so my intent was just to help you (collectively) be well understood, particularly by newcomers, who are probably used to the usual/common meaning of these terms. If you prefer to change nothing (and take the chance to be misunderstood), that's OK for me. Sure, it's a minor point. Perhaps you aren't aware that the usual way things are done in English is to state the term, define it, and then use it. English is a very versatile language and I doubt that any newcomers (other than French with OCD issues) would have any difficulty understanding a simple statement that DEFINES itself. It's also the way things are done in science; it's perfectly acceptable, and usual, to take a term to use in a specific way as long as you define it. You should find something useful to do in this life. Time is running out. Indeed, I wasn't aware. I'm already aware of this for sciences and philosophy, or contracts legalese, but not for general discussions in English. Not being a native speaker has some disadvantages... With your explanations, I get the point, thanks. "The word "Spam", as it is used here, means the repeated and unrequested transmission of contents to a person or a group. ...)"
That is the exact meaning of spam as it is used in our "rules". This last word: Medium, strongly suggests that this definition is saying that "flooding" is very close to something like a DDOS attack, i.e. overloading a system (medium) so that it crashes (disturb the normal operation). I didn't catch that the first time I parsed it, but fact is, it just gives more weight to our use of "spam" as being "correct" even in Bastian's world. By the way, what prompted you to use an image of the Angel Oak as your avatar? Are you aware of the amazing qualities of Quercus Virginiana? By the way, what prompted you to use an image of the Angel Oak as your avatar? Nothing special or related to this specimen. I love trees, particularly oaks, to me they are symbols of wisdom and are aesthetically pleasing, so they could make a good avatar. 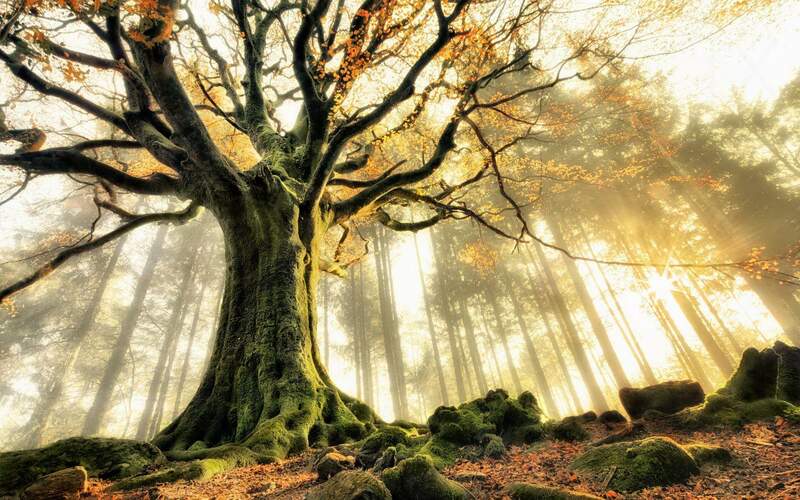 Another nice candidate was this picture (I believe it is Pontus' beech in Broceliand forest in Britanny). Are you aware of the amazing qualities of Quercus Virginiana? I wasn't, only that it's evergreen. What's amazing in your opinion, its wood qualities, usefulness for non-timber products, or anything more esoteric ? Native Americans extracted a cooking oil from the acorns, used all parts of live oak for medicinal purposes, leaves for making rugs, and bark for dyes. The roots of seedlings sometimes form starchy, edible tubers. People in past centuries harvested and fried these tubers for human consumption much as one might use a potato. BTW, in biology the rule for binomial names is that the second part is fully in lower case : eg. Homo sapiens (to distinguish well between the genus and the species). And sorry to be "tetraphyloctomous" again, I'm attached to precise wording for good understanding (so a bit autistic, rather than having OCD). In NLP terms, I use the metaprogram "details" a lot more and before the "big picture" one. My intent posting the initial message was to help, not to waste anyone's time. PS : when I write "a bit autistic", I mean that the need for precise wording is a common trait among "Aspie" (Asperger syndrom) and/or "gifted" people. I know well that "neuro-typical" people do not feel this need (and I do not include you, Laura, in this group), so usually use imprecise words, but from my POV it may help everyone to use precise ones. As we say in French : "niveler par le haut" (level up). I capitalized Virginiana because Virginia is a proper noun, and in English, proper nouns are always capitalized, though in French, they are not, nor in biological names. And you are right, nit-picking details irritate me because the world is on fire, and energy needs to be put where it belongs. Perhaps you would benefit a great deal from about 50 to 100 NeurOptimal sessions? You are totally right, sorry for the disturbance. Probably, who would not benefit a great deal from that ? I'll explore that, thanks for the suggestion (and reminding).